A protester holds a sign outside a closed gate at the Port of Entry facility, June 21, 2018, in Fabens, Texas, where tent shelters are being used to house separated family members. 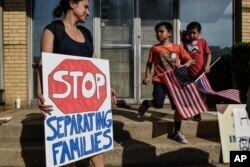 Among the parents of more than 2,300 separated migrant children, three Central American parents sued the U.S. government over its policy of family separations Wednesday, the day U.S. President Donald Trump, under intense public pressure, ordered an end to the practice. But three days later, their situation had not changed and they’re “desperate” for information about the whereabouts and well-being of their children, their lawyer said. The administration says it is forging ahead with plans to reunite the parents with the thousands of children separated since early May when officials announced a “zero tolerance policy” on illegal entry into the United States. Late Friday, U.S. Customs and Border Protection said it had reunited about 500 families, saying “all unaccompanied children in their custody” had been reunited with their families. But the status of many more transferred out of CBP custody remains uncertain. 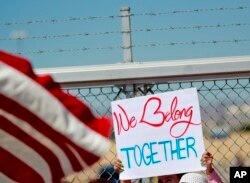 Wesevich said the uncertainty has left the migrant parents in the dark. Meanwhile, legal assistance organizations are trying to locate migrant families caught up in the confusion and chaos that followed Trump’s order. 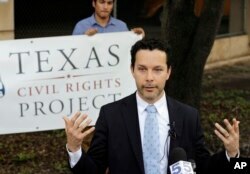 Immigration attorney Efren Olivares, with the Texas Civil Rights Project, answers a question during a news conference outside the Federal Courthouse, June 22, 2018, in McAllen, Texas. The Texas Civil Rights Project, an advocacy organization based in Austin, Texas, is leading one of the largest reunification efforts in the state, seeking to reunite as many as 381 immigrants who have been separated from their children. Texas RioGrande Legal Aid said it would continue its efforts on behalf of the three Central American parents as it awaits clarity about how the government intends to reunite the separated families. A second parent, a Honduran mother of a 9-year-old son, has told the nonprofit that she believes her son has been moved to New York. “She does not know where he is, except she believes that he is in New York while she is detained in El Paso, Texas,” according to court papers. Since their separation, the mother has been allowed to speak with her son three times for about five minutes each time, according to court filings. “He only asks when we will see each other again and begs to be with me,” the mother is quoted as saying in court documents. The third parent, a Guatemalan mother of three sons, ages 2, 6 and 13, has been allowed to speak with them for 10 minutes two times each week. “Of course her 2-year-old is unable to provide reliable information about his circumstances, and staff provide only general information to [her], nothing specific about her children’s well-being, which causes her anguish,” according to court papers. The plaintiffs are seeking “frequent and meaningful access to or communication” with their children.